This is the 19th year of tracking wages through job postings in the Jobs in British Archaeology series. As recently pointed out in the 2013 Profiling the Profession report (Aitchison and Rocks-Macqueen 2013) job postings provide a relatively accurate portrait of wages for archaeologists (Figure 1). Of course, this sort of reporting works better for positions that have a larger number of job postings. As one would expect more data leads to greater accuracy. This article continues the tradition of measuring wages through job postings though with some slight changes in methodology. The data was gathered from both the IfA’s Jobs Information Service and BAJR’s job postings from 1 April 2012 to 31 March 2013. A special thanks to the IfA and David Connolly for providing the data. Each job advertised was treated as a single data point and the advertised pay rate counted, those without pay rates were not counted. This year has seen a slight change in titles for positions. Moreover, since it has been several years since the actual positions have been defined for the Jobs in British Archaeology series it would be good to do so again here. Technician– Formally referred to Excavator, this position covers a range of titles from Site Assistant to Digger. These are entry level positions in commercial archaeology. In a clarification from past reviews it does not just cover field workers but those that work in the lab as well, although very few lab positions are ever advertised. Supervisor– Responsible for running the whole or part of a site. Project Officer– Formally called Field Officers the title was changed to Project Officer to both reflect what most companies now call this position and the fact that officers can be in charge of wider range of projects, not just those in the ‘field’. Essentially, this is middle management for many commercial archaeology firms. Senior Managers– Formally called Project Managers this title was change to avoid naming confusion and to more accurately reflect the range of titles given to these times of positions. This is the senior management at any commercial archaeology organization. Junior and Senior Sites and Monuments Records (SMR) / Cultural Resource Managers (CRM)- These titles have not changed and reflect those with responsibilities to manager and protect the cultural heritage. Junior positions are those that do not general have management responsibility over others while senior positions are those who would line manage others. Consultants– This title has not changed and reflects those who offer consulting services. Illustrator– Those who work as Illustrators or whose main responsibility is graphics. Conservation– Those who work in conservation, however, it is mainly focused on heritage and museum positions were excluded were possible. Geophysics– As the name suggests those that conduct geophysical work. Surveyor– This category covers both landscape and building surveyors. Curator and collections– Only positions that specifically mentioned archeology, archaeological remains or required archaeological experience were included. Thus most museum curator positions were not included. Archaeological Sciences– A broad subject that covers such positions as environment and geomorphology archaeologists. Essentially, those with a specialty in an archaeological science field not covered by other positions. Community and Education– Those positions that involved archaeological community, public or educational engagement but excluding university positions such as Lecture. Jobs were categorised based on the description of the job given. In some cases, no descriptions were given, or were vague, which resulted in attempts to hunt down the original job posting on the employers’ website. For the most part this was sufficient enough to determine how a job should be characterised but in a few cases this was based off of job title alone, though only in a few cases. When a salary range was given in a job advert the middle point was used for averages and in the distribution table eg. Salary £15k-16k, midpoint is £15,500. The only exception to this in the tables is highest and lowest salaries offered with are not based on midpoints but any salary offered. Hourly, daily, weekly or part time wages were converted into full annual salary equivalents. All calculations are done on pro rata bases of a full year’s salary. Hourly and weekly rates are also given in the distribution section of the tables for those who may not work full time or who do not work all year round. Because the midpoint is used as the reference for pay it is important to remember that the numbers in this article are all averages. While this sort of averaging works for many positions it may not be applicable to all. For example, technician positions are usually on short term contracts and technicians tend to move from company to company. Constantly starting work at new organizations usually means starting at the bottom of the pay scale. Thus how many people actually make the highest, or even average, advertised pay may be a very small minority among technicians. Overall 430 positions were recorded for the 2012-13 year. The data shows a slight uptick in average pay for most positions (Figures 2 & 3). Though distribution is probably a better indication of what most archaeologists are making. For example, the largest number of supervisors make between £18,000-18,999 annual salary, or roughly £9.20 to £9.70 an hour. However, the average is raised slightly to roughly £19,500 by those making £20k+ in that type of position. 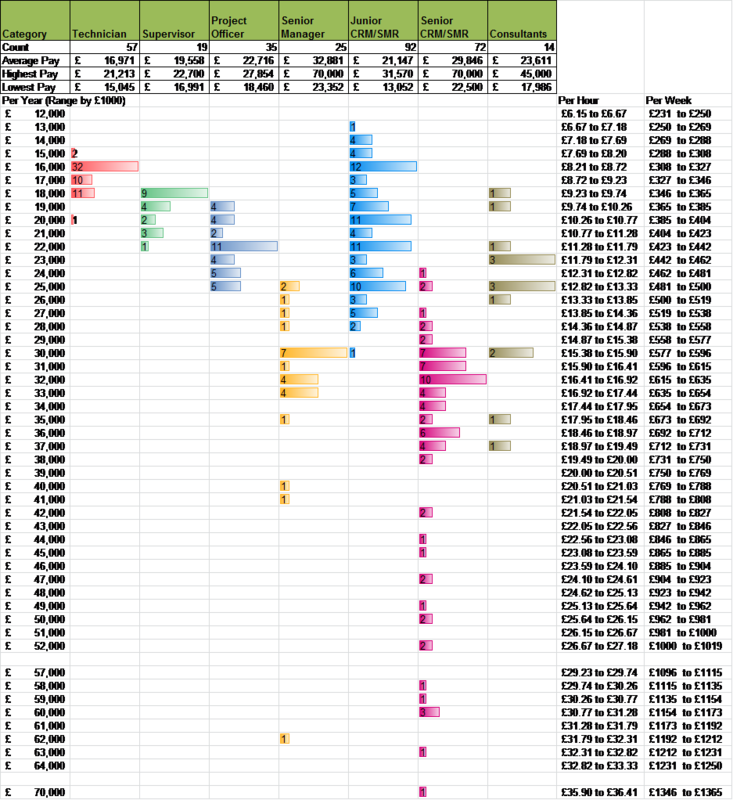 Overall, the data shows clustering for most positions near certain salaries. A few positions don’t cluster but this is because the broad range of jobs that are included or because of low sampling. In the case of Community and Education positions the CBA bursaries cause clustering at the lower end of salaries and should probably be ignored. 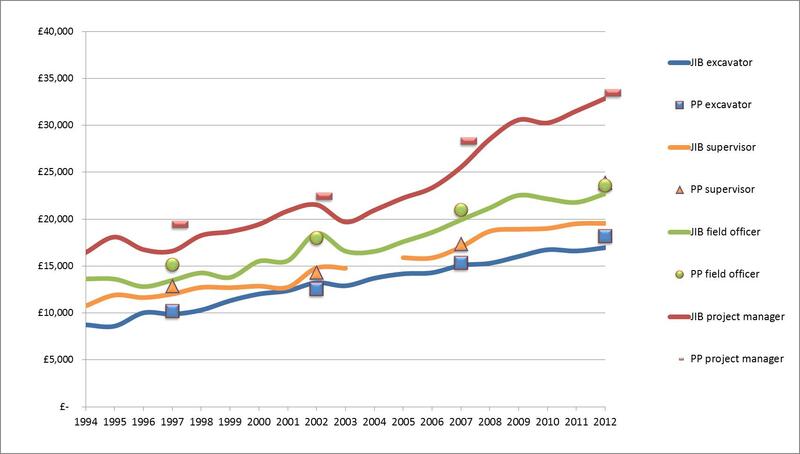 Figure1: Profiling the Profession average pay against Jobs in British Archaeology series from 1994 to 2012-13 based on graph from (Aitchison and Rocks-Macqueen 2013) with this year’s data included. PP- Profiling the Profession results. JIB- Jobs in British Archaeology Results. Figure 2: Pay conditions for 2012-13 year for Commercial and SMR/CRM positions. Figure 3: Pay conditions for 2012-13 year for specialists positions. 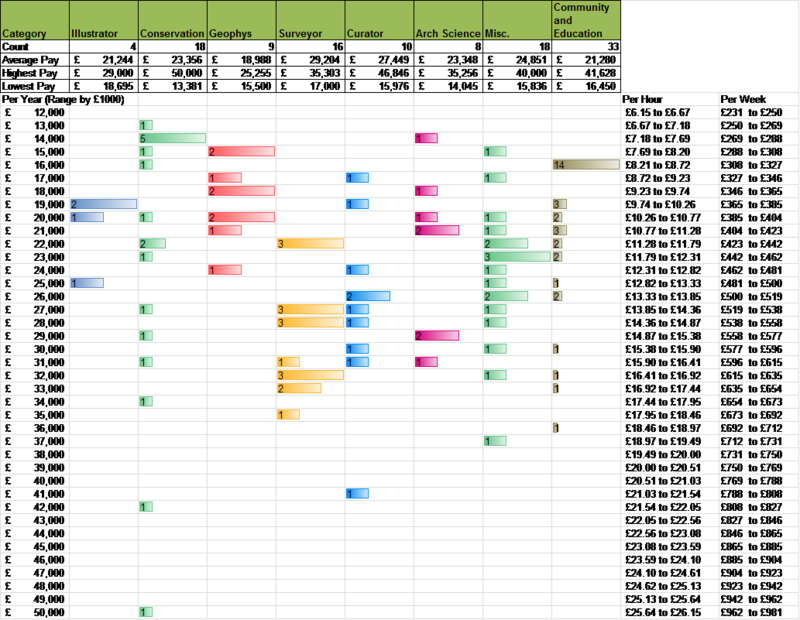 Archaeology Labour Market Intelligence: Profiling the Profession 2012-13. Landward Research Ltd.
As a student of Archaeology (through Science rather than Arts), this post is much appreciated. As an analyst in the past I can understand some of the time involved, so the post is twice appreciated. On the first read I missed text errors as I was hungry for the information. Second read yielded a few text errors that spell check could not grab “of courses” etc. I will read again later and compile what I find. Thank you for this information and your efforts. I hope in time to gain one of the upper levels of pay myself, so it is always nice to get the lay of the land. I am terribly sorry for not keeping my word on this. I will go through this now. Just a mention, but have you had a look at the corporate archaeology sector at all and its state of health? Copies of Company accounts are just £1 each from companies house online. Formats may differ but you may find a sector wide thread. Hmmm interesting idea. Thank you for that. The biggest problem I would have is funding. Even at 1 it will add up pretty quickly, there are several hundred archaeology companies but it is something I can try and figure out. Cheers, really appreciate that suggestion. It can get a bit murky – remember its only the companies still running that matter. I was surprised when I looked in a different jurisdiction how many had been dissolved/liquidated/struck off. The other issue is non uniform accounts. It can be difficult to get a common thread sometimes, but in my case it has been worth it.